Cut pears in half and core, using a spoon or sharp knife. Melt butter in a casserole dish large enough to hold pears (9x13) in the oven. Place pears in dish cut side down and roast for 15 to 20 minutes – until a knife is easily inserted. Flip pears, add walnuts to the casserole dish to brown and drizzle about ½ Tbsp of balsamic vinegar over each pear half. 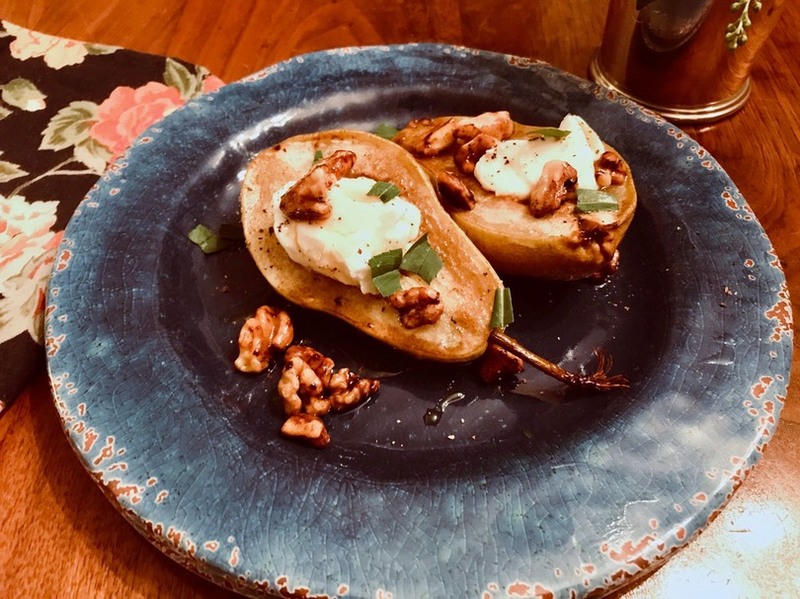 To serve, put about 1 Tbsp goat cheese in the center of each pear half, drizzle with honey and top with a grind of pepper. Top with toasted walnuts and tarragon if desired. * I used a flavored balsamic vinegar, but any type you like will be fine.